Have you ever wondered how a word was pronounced in Dutch or have you wanted to learn the Dutch language? I have found a wonderful website to help you with both of these things. I know I have needed help a few times in researching my father-in-law's ancestry as it is 100% Dutch. I turn to Marco Schuffelen's Hear Dutch Here website for help, which is an excellent Dutch language resource. The site map page provides an overview of what is available on this website. Below are a few of the Dutch language topics one will find on this site. Place Names of towns, cities, etc. The next time you need help translating a document or you would like to hear how your great grandmother, Neeltje, is pronounced, check out Hear Dutch Here website. 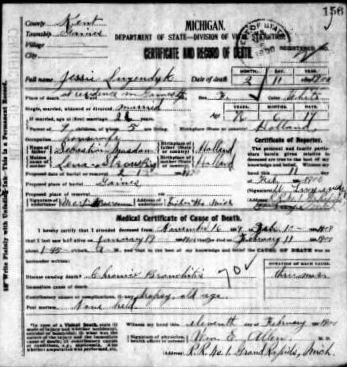 Source: State of Michigan, "Death Records 1897-1920," database, State of Michigan, Seeking Michigan (http://seekingmichigan.org/discover-collection?collection=p129401coll7: accessed 23 January 2013), death certificate of Jessie Suyendyk, as indexed, number 156; citing Michigan Department of State, Lansing, Vital Statistics Division. Jessie Luyendyk was born Jaapje Maasdam on 23 July 1823 in Zuid-Beijerland, Zuid-Holland, Netherlands to Bastian Maasdam and Lijntje Stroobergen. Jaapje Maasdam married Pieter Luijendijk on 7 May 1847 in the same place as her birth. They immigrated to the United States in 1849, settling in Grand Raids, Kent, Michigan area by 1870. I was surprised by the accuracy of the information provided on Jaapje/Jessie's death certificate, except for the fact that this certificate is indexed as Jessie Suyendyk. The informant was ? Luyendyk, with the ? possibly being a "D". If it is a "D", then it could be her son, Daniel. Jessie Luyendyk died at her residence in Gaines Township, Kent, Michigan on 11 February 1900. The cause of death was chronic bronchitis which she had for three months previous to her death. Jessie Luyendyk is buried in Blaine Cemetery, Gaines Township, Kent, Michigan without a gravestone. 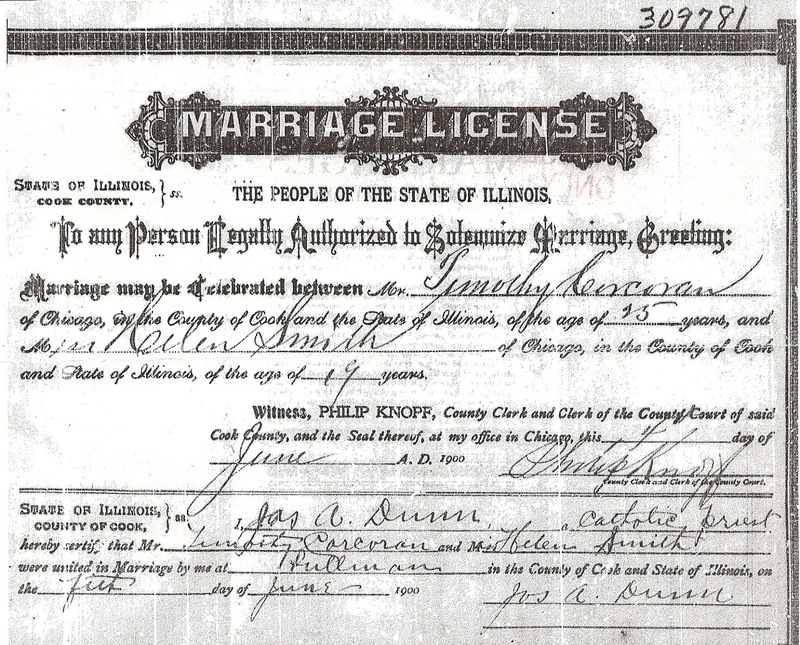 Source: Cook County, Illinois, marriage no. 309781 (5 June 1900), Timothy Corcoran and Helen Smith; Cook County Clerk's Office, Chicago, Illinois. Miss Helen Smith of Chicago, in the County of Cook and State of Illinois, of the age of 19 years. hereby certify that Mr. Timothy Corcoran and Miss Helen Smith were united in Marriage by me at Pullman in the County of Cook and State of Illinois, on fifth day of June 1900. Previously, I had posted Timothy and Helen Corcoran's marriage license, but I didn't transcribe it or go into any depth. I feel I need to start transcribing the information. I thought it was interesting that they were married at Pullman and wondered if Timothy Corcoran worked for Pullman at the time. The Pullman Company was a manufacturer of railroad cars and known for its' planned town. It is something I need to explore further. Helen Smith was born Helen Schmitt and was 17 at the time of marriage, not 19. Otherwise, I believe the information on the license is correct. Howard James Corcoran was born in Chicago, Illinois to Timothy Francis Corcoran and Helen F. Schmitt. Howard is buried in Woodlawn Cemetery, Grand Rapids, Kent, Michigan. Howard Corcoran is Kirk's great uncle. Where in the World is Leona Dollaway Corcoran? One of the first place a genealogist looks for family information is in census records. I have decided to make census tables showing the place of residence for each ancestor. The census table below is for Kirk's maternal grandmother, Leona Dollaway who married Bertrand Corcoran, in 1925. I am having trouble locating Leona, and the Dollaway's, in the 1920 United States Census. I believe they were living in Lowell Township, Kent, Michigan at this time. I went page by page for Lowell census records and didn't find them. I used Heritage Quest, Ancestry.com and Family Search census records. I even searched for all the Leona's in Michigan at Heritage Quest. Kirk and I spent a day last summer visiting ancestral places in Grand Rapids, Michigan. This is the area where many of Kirk's ancestors settled. One special visit was to St. Andrew's Cathedral. St. Andrew's is located at 301 Sheldon Blvd., Grand Rapids, Michigan. Kirk's grandfather, Bertrand Corcoran, attended high school at Catholic Central High School which is across the piazza of St. Andrew's. Kirk's grandparents, Bertrand and Leona (Dollaway) Corcoran were married here in 1925. I would love to have a picture of their wedding at St. Andrew's, but so far haven't found one. Kirk's great grandparents, Timothy F. Corcoran and Helen (Schmitt) Corcoran's funerals were held at St. Andrew's. Timothy Corcoran and family lived on Lafayette Street in Grand Rapids, which is just a few blocks from St. Andrew's. St. Andrew's was the family church when Bertrand and his brother, Howard, were growing up. The pictures below are from our visit to St. Andrew's in 2012. St. Andrew's Cathedral and Piazza Secchia which was laid in 2009. The Piazza Secchia explaining that St. Andrew's Piazza was modeled after Michelangelo's Piazza del Campidoglio in Rome.